Support for the Atmel SAM L21 Xplained Pro board. 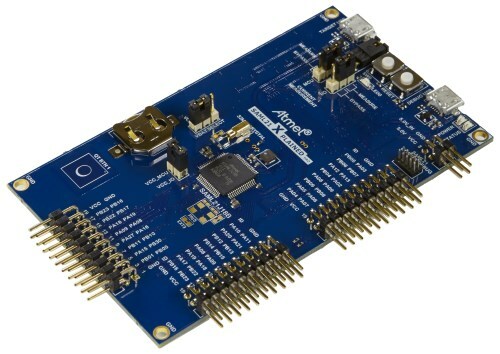 The SAML21 Xplained Pro is an ultra-low power evaluation board by Atmel featuring a ATSAML21J18A SoC. The SoC includes a SAML21 ARM Cortex-M0+ micro- controller. For programming the MCU comes with 32Kb of RAM and 256Kb of flash memory. The saml21-xpro is available from various hardware vendors for ~50USD (as of oct. 2015). Connect the device to your Micro-USB cable using the port labeled as EDBG. The standard method for flashing RIOT to the saml21-xpro is using OpenOCD. Please note that even the latest official OpenOCD (v0.9 at the time of this writing) does not support B-variant SAML21 devices. If you attempt to flash a board, and OpenOCD throws a Couldn't find part correspoding to DID XXXXXXXX error, you will need to compile your own OpenOCD from source. For using the saml21-xpro board we strongly recommend the usage of the GNU Tools for ARM Embedded Processors toolchain. It can happen that OpenOCD is not able to program the board, because of wrong clock configuration or low power modes. In this case you can use this little tool to erase the flash. Just follow the instructions to build it and run ./edbg -e to erase the flash. Then press the reset button and you're able to program via OpenOCD again. Board configuration for the Arduino API. Mapping from board pins to Arduino pins. Board specific definitions for the Atmel SAM L21 Xplained Pro board. Peripheral MCU configuration for the Atmel SAM L21 Xplained Pro board.